Home > Holland > Galileo Reference Centre in Noordwijk: Building by de Architekten Cie.
Galileo Reference Centre in Noordwijk: Building by de Architekten Cie. 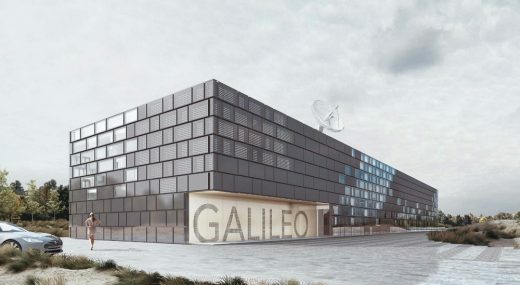 The Galileo Reference Centre, located in Noordwijk Space Business Park, is a 1500 m2 free standing building, according to this Dutch architecture practice. The centre will receive data from the Galileo satellite system. The development of a non-military Global Navigation Satellite System (GNSS) is founded by the partnership between the European Union (EU) and the European Space Agency ESA. The elongated two-storey building on the edge of the dunes contains mainly offices with support facilities and several computer rooms. 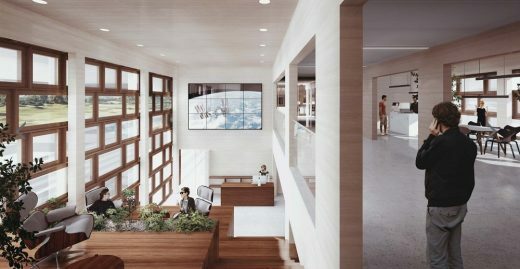 The entrance lobby acts as the social heart of the building and enhance connectivity. 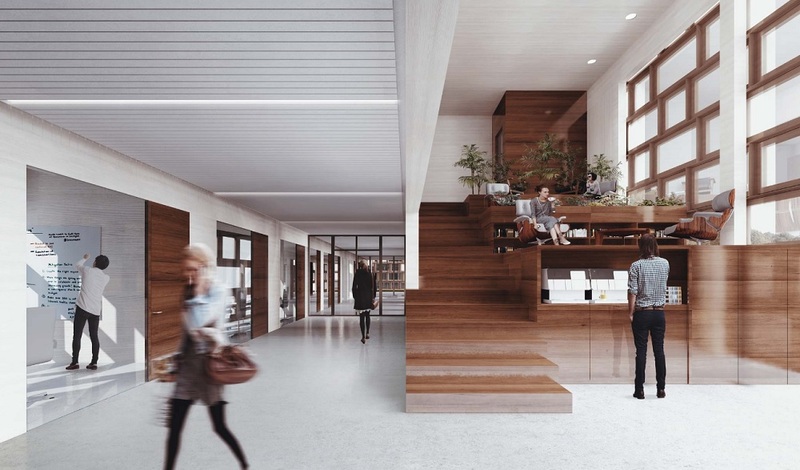 The lobby is designed similarly to furniture and functions both as a staircase to the first floor as well as an occupiable space with green terraces and integrated facility services. It makes the entrance lobby a place to meet, start the day, and receive visitors. The functional areas are positioned along a wide corridor in a grid of 3.60 m. Along this corridor are two patio areas situated to bring greenery and wildlife of the surrounding area into the building. Galileo is designed to be both flexible and transparent, where natural light and views provide reference points. The Galileo building is unique because of its circular and sustainable design. 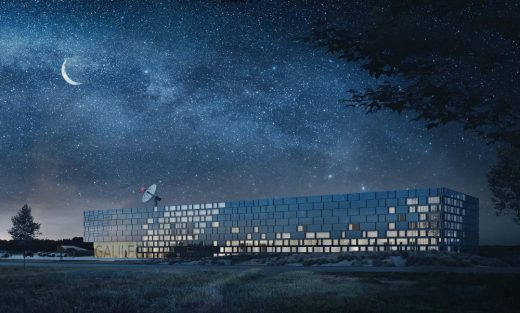 The ambition is to create a waste-free and resilient building in which the materials used are chosen for future reuse. Partly for this reason, wood has been chosen as the primary building material. Both the main structure, first floor, and roof are made of oversized composite, prefabricated, pine elements. 3. the modular prefabrication design yields a timely, minimal waste construction. The facade is composed of a pattern of exchangeable elements which have been designed in three versions; transparent, semi-transparent, and opaque. The system allows the building to be transparent and engaging, or closed and introverted, in the required areas. The function of the areas can easily be converted in the future by interchanging the elements types. This makes the building flexible and future-proof. The building is energy conscious. A series of measurements, including the reuse of the energy generated by the heat of computer servers, concluded the building will be 35% more energy efficient than required by current building regulations. 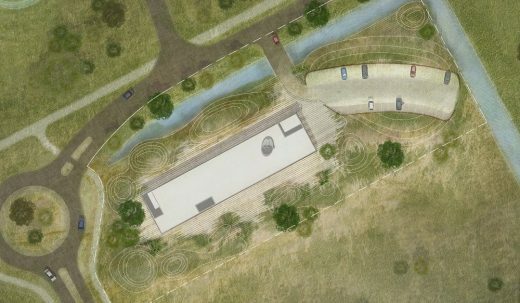 The building will be completed in record time; It must be in use on July 1st 2017. Website: Galileo Reference Centre Noordwijk – project post by by de Architekten Cie.